Of these 35 employees, 26 got raises, ranging from 1.5% to 12%, in a 17 month period. 26/35, or 74% of employees, got pay raises averaging 4.13%. Of those that got raises, the average was 5.4%. 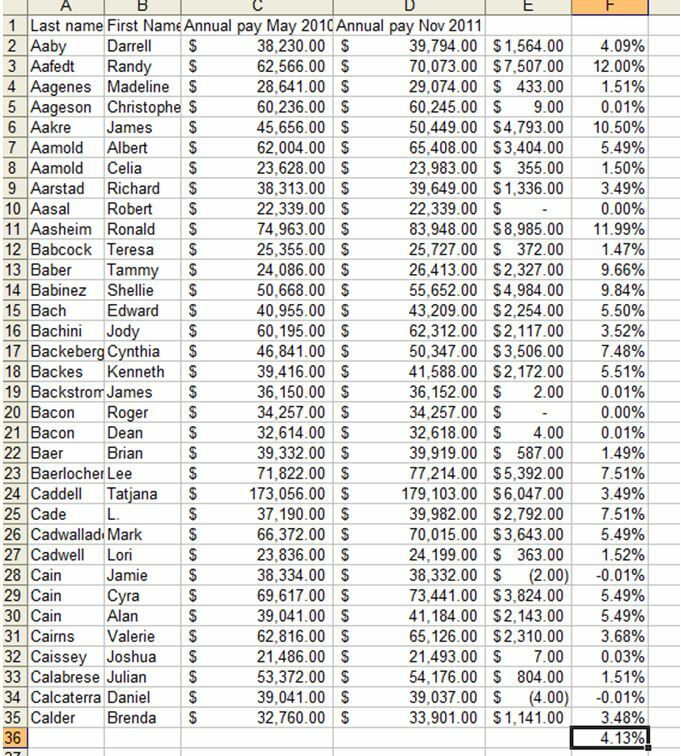 This data set of 35 is more randomly selected, and thus more indicative of the entire list of 14,000 employees, than the data set below of 59, wherein 19/23 that didn’t appear on the first list, got raises, 83%. Raises ranged from $355 to $14,327. Below is a larger data set with 59 employees. It includes the set above and adds some randomly selected Department of Administration employees and 13 Department of Administration employees who got bonuses on top of their raises. They are the last 13 in the table. Besides raises, bonuses ranged from $510 to $3,600. The largest raise was 17.2%. Montana state employees voluntarily agreed to a two-year pay freeze in 2009 to help balance the state budget when the Great Recession hitMontana.